Things have been very busy. Our flower people, Dr. Tom Daniel and Rebecca Wenk have been very active. Rebecca successfully completed her M.Sc . degree at San Francisco State University, based in part on plants she collected in the islands during GG III (A). 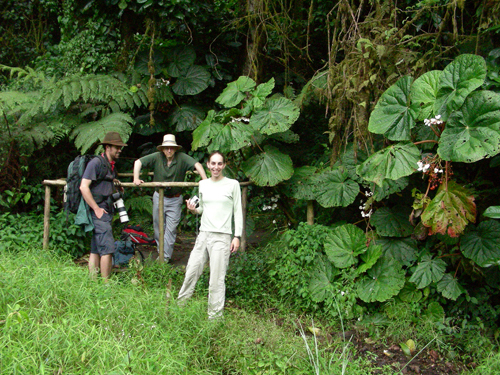 She then published her research, with Tom, in the latest Proceedings of the California Academy of Sciences; the publication includes a special treatment of the genus Elytraria – E. mariginata is the little flower that Rebecca finally found high up on Pico Papagaio on Príncipe that was so exciting and which we reported last May. (See “News from the Flower people”). Rebecca among the giant Begonias. Lagoa Amelia. Wenk camera: GG III. Tom is nearing completion of his monograph on the acanthus (shrimp) flowers of São Tomé and Pr<!–[if gte msEquation 12]>í<! [endif]–> ncipe. 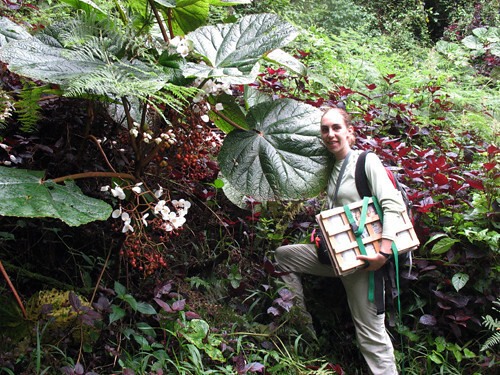 He is now collaborating with Estrela Figueiredo, a Portuguese botanist who has been on the islands many times and has added much to our knowledge of the botany of the Gulf of Guinea as a whole There are several species of the Acanthaceae found only on São Tomé and Príncipe and one (Heteradelphia paulowilhelmia) which may be endemic at the genus-level. We found this beautiful flower in the middle of Lagoa Amelia at 1400 m. during GG III. 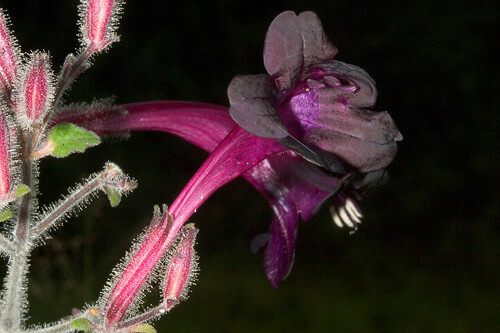 Another species in Tom’s group that is of particular interest to me personally is an acanth called Justicia thomeensis. This flower is known only from São Tomé and has not been collected since the late 19th Century – the original collector did not provide detailed locality data, and we have not found it on the islands yet. We hope it is not extinct, or that it was not actually collected somewhere else. Tom has examined the original dried specimens in Coimbra; it is perfectly valid, and he is re-describing the species. 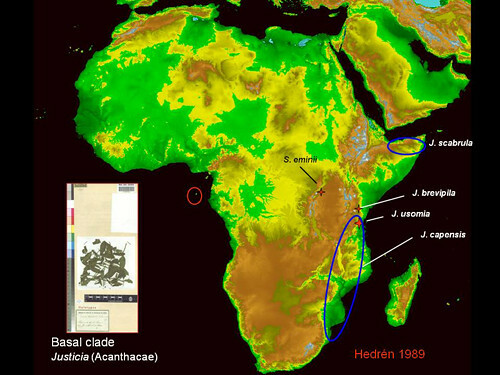 Another botanist named Hedrén examined this material, and in a 1989 study found that J. thomeensis is more closely related to a group of species in East Africa than to any in nearby West Africa. I am finding the same strange disparate distribution patterns among my island frogs. On the crustacean front, Alex Kim, our freshwater shrimp colleague (see January and March blogs) has decided to attend Harvard for his undergraduate studies, and this summer he is doing fieldwork on prawns in Puerto Rico. He tells us that the São Tomé specimens collected for him earlier this year by the marine group “..represent at least two species which, based on morphology, have clear affinities with New World forms. 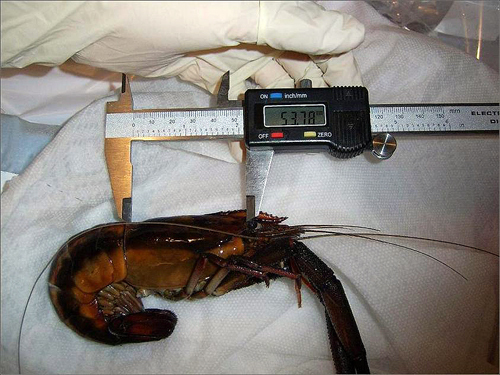 DNA analysis is still ongoing, but the geological youth of these prawns leads me to suspect that we will soon have genetic evidence of trans-Atlantic larval dispersal.” Pretty impressive stuff for an incoming freshman. A New World prawn. Alex Kim phot. 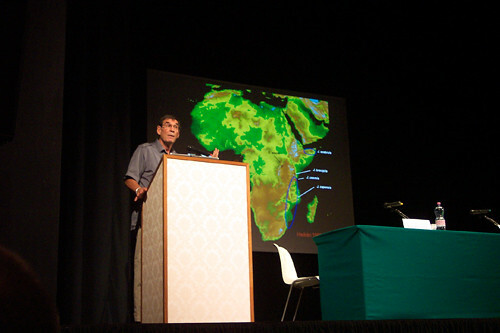 A few months ago I had an opportunity to lecture on some of the scientific results of our Gulf of Guinea Island expeditions to a group of biologists at international meetings in Sardinia; afterward in Spain, I met one of the foremost experts on bats, Javier Juste, of Institute Doñana in Seville who has also worked on the islands and has discovered some of the same strange evolutionary relationships that we have. We are about to send him bat tissues from our GGI collection for DNA extraction. 7th Congresso Nazionale, Societas Herpetologica Italica. Sardinia. C. Corti phot. In earlier blogs, we discussed the fact that mammals make poor dispersers over saltwater barriers; except for some bats, mammals simply cannot survive long enough to colonize oceanic islands. This is because we mammals have to eat regularly in order to maintain constant body temperatures –without “stoking the furnace” by eating regularly, mammals quickly die of exposure. This is specially the case with shrews; because of the ratio of their tiny body masses to their surface area, shrews lose heat faster than any other mammal, and a shrew has eat almost constantly, or it dies of hypothermia. It is perhaps a testimony to the great geological age of São Tomé and Príncipe that shrews appear to have, nevertheless, successfully colonized both islands! 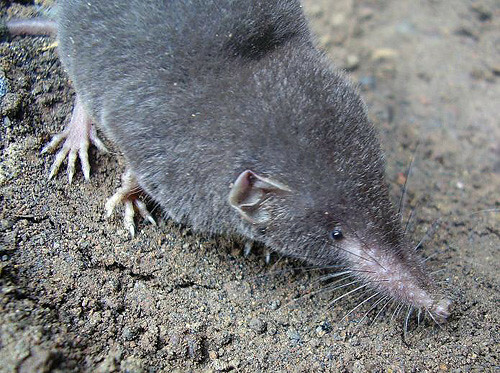 If the two species are indeed valid and occur naturally (not brought to the islands accidentally through human agency), then these may be the only oceanic island shrews in the world. To our knowledge, the photographs above and below are the first ever published of the supposedly endemic São Tomé shrew, Crocidura thomensis. 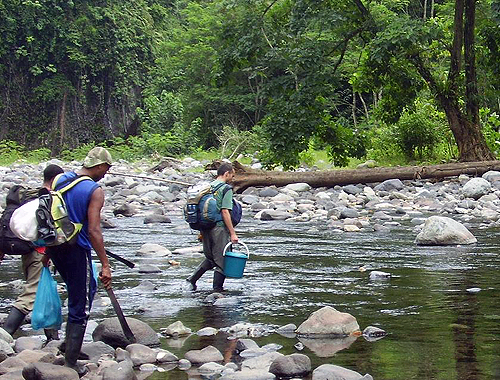 The photographs were taken by Ricardo Lima, a doctoral candidate at the University of Lancaster who is studying the environmental effects of various agro-forestry techniques on São Tomé. Ricardo tells us that the shrews are not at all rare; in spite of this, we don’t know much about this little critter, nor the one on Príncipe. The São Tomé species was first discovered in 1886 by the great Portuguese explorer, Francisco Newton and described in 1887. C. thomensis. R. Lima phot. 2009. The relationships of these small island insectivores were not assessed until nearly 100 years later by Heim de Balsac and Hutterer in 1982. 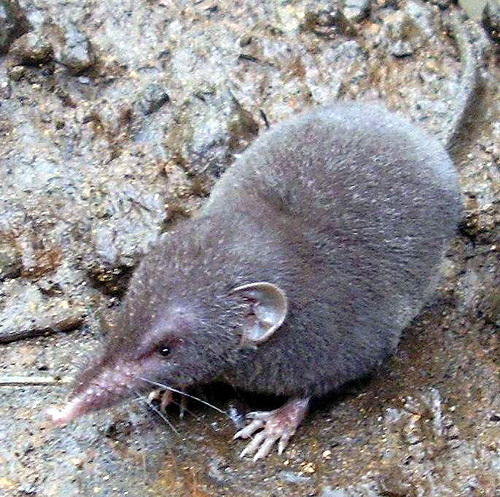 These authors concluded (on morphological evidence) that the São Tomé shrew was a full endemic species, and that the Príncipe form was an endemic subspecies of Fraser’s musk shrew (C. poensis) which is widespread on mainland Africa. Ricardo Lima and friends, crossing the Rio Lemba, Sao Tome. 2009. Now, we are in the exciting position of being able to test these assumptions using modern genetic techniques; just how closely related are the two shrews, based on DNA sequence? Did these mammals arrive naturally by rafting, as we suggest for the amphibians? Perhaps millions of years ago? Or were they hitchhikers on an old Portuguese galleon a couple of hundred of years ago? We hope to find out. Finally, our mycologists have a huge job. 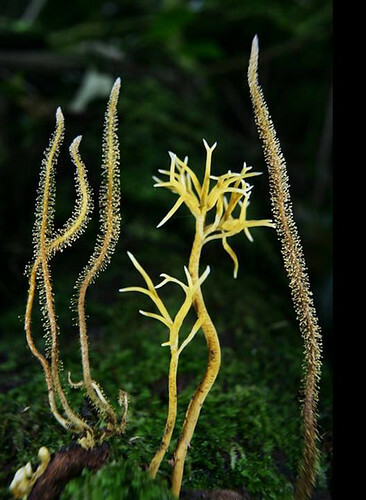 As you know before our expeditions began back in 2001, there were only four species of mushrooms known from São Tomé, and Príncipe had never been sampled. Now, after Dr. Dennis Desjardin’s work on GG II (2006) and his subsequent return with Dr. Brian Perry during GG III last year, we now have 225 species (including 75 listed for the first time on Príncipe). Many of these are probably new to science and it will be a major effort to fully analyze the entire collection. But Dennis and Brian took the opportunity to describe one of the new species separately. It has just been formally published in the journal Mycologia, and they have named it after me! It is a weird looking thing, and I will describe the whole process (including the humor sometimes involved) in the next blog. 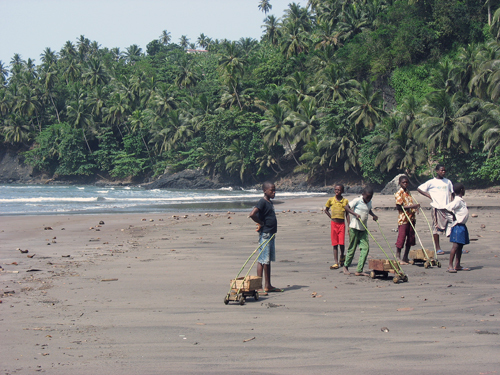 We gratefully acknowledge the support of the G. Lindsay Field Research Fund, Hagey Research Venture Fund of the California Academy of Sciences, the Société de Conservation et Développement (SCD) for logistics, ground transportation and lodging, STePUP of Sao Tome http://www.stepup.st/, Arlindo de Ceita Carvalho, Director General, and Victor Bomfim, Salvador Sousa Pontes and Danilo Bardero of the Ministry of Environment, Republic of São Tomé and Príncipe for permission to export specimens for study, and the continued support of Bastien Loloumb of Monte Pico and Faustino Oliviera, Director of the botanical garden at Bom Sucesso. Special thanks for the generosity of private individuals, George G. Breed, Gerry F. Ohrstrom, Timothy M. Muller, Mrs. W. H. V. Brooke and Mr. and Mrs. Michael Murakami for helping make these expeditions possible.